Basically it's my cookie cutter build with sometimes some minor changes (for example taking Collateral Damage on Mythic Vectis). I get my input from other Warriors / the Warrior Discord / Wowhead's Warrior Raiding Tips. The choice of Talents is made on getting the optimal output of damage for my class and I will take changes according to talent changes etc. Once again it's somewhat cookie cutter for Warrior with more priorization on stats than on ilvl because Warrior scales better with stats than strength. For optimized stats I sim my character on a regular basis. Also looking at Bloodmallet for Warriors. Well in general I always raided and cleared a lot of Raids. I really started raiding back in WotlK and cleared 10 man and 25 man. Well there haven't been any big names, like I said before in Cataclysm ,when I raided with my brother and friends, we managed to keep up with some top guilds. So I guess I will tell you about my latest Guild the most. At the end of Legion a Group of friends, my brother and me joined the old Guild of one of his friends. We started raiding Uldir as soon as it came out and progressed from there on. But a lot changed for me in that Guild (my brother stopped playing, a friend got kicked out of the guild) and so I decided to leave as well. The Guild climate really changed a lot and they invited a lot of annoying people and they kinda fucked me over in reclears to gift the achievment to guild friends and invited me back for progressing bosses. Yes but I would like to talk to you personally about this because it might be troublesome for me from time to time but I would rather not write it in public because I contains some IRL stuff. DAMAGE. Joke aside.... I will add a solid player to your Raid. I am not someone who plays for his logs or wants to be on top of the damage meters but rather kill a boss and do everything to make it possible. I will always inform myself what I can do in a specific encounter and how to play it as perfect as possible. I know how to play my Warrior to all it's strengths and weaknesses but I am always willing to listen to other players and learn from them and become my very best. Love it. I just like that feeling when you can finally kill that one boss you pulled so many times and when you can see a progression from pull to pull so with that strive to kill stuff I am not easily tilted or annoyed when we wipe because it's part of progression raiding. Today I heard of you on wowprogress.com because Nagassh contacted me. Seeing that you managed to 8/8 Mythic clear Uldir with that low of a raid time kinda impressed me and I have to admit I also was suprised to get contacted by a 8/8 Guild even though I only have 6/8 (should've been 7/8 but yeah ... my old Guild). Seeing that and wanting to progress further into Uldir and searching a Guild which will have a future in Battle for Dazar'alor I went ahead and wrote this application. Yes of course. 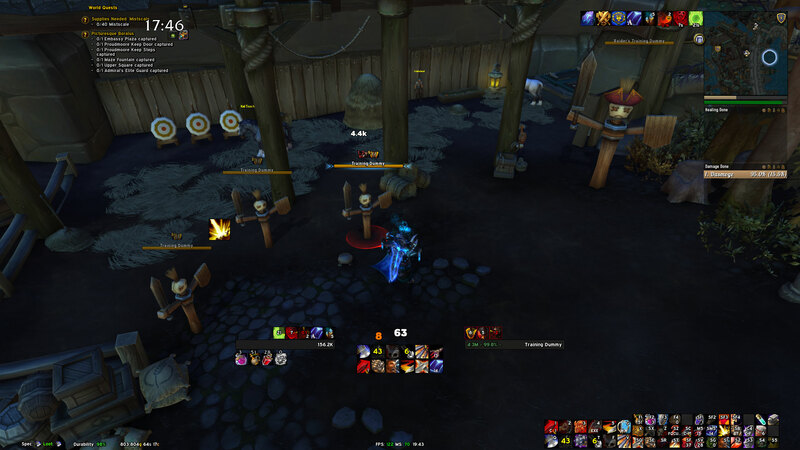 I try to do as much Mythic+ as I can (and get invited to as a Warrior), recently started playing Arena and really liking it and I am a altaholic with like around 8 classes on 120. So even though I am not always on on my Warrior I play a lot of WoW and focus on my main Character as much as possible. Thanks for the application, copying to our members section for discussion, someone will be in touch soon! Application declined I'm afraid. Thanks for applying and good luck with your search.